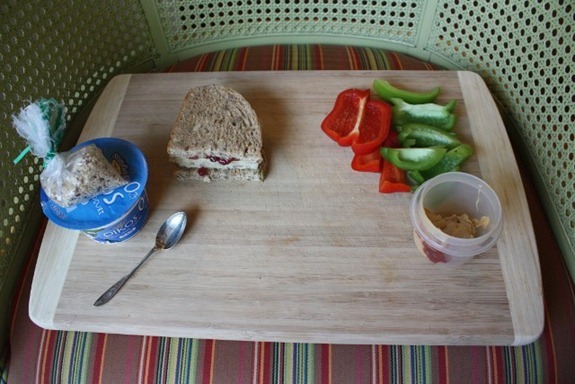 Every so often I get requests for lunchbox ideas from those of you who eat your lunches anywhere but home. 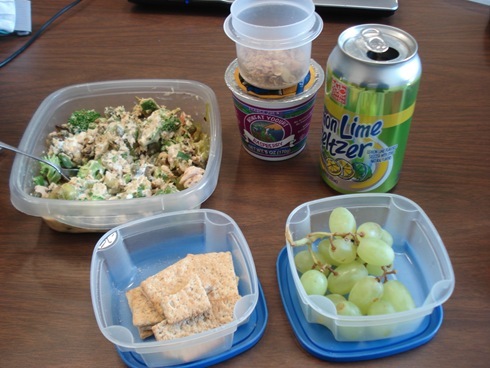 I refer people to search for posts from “Spring 2010 when I packed my lunch everyday for my internship.” I realize that is a vague response because those posts are hard to find! 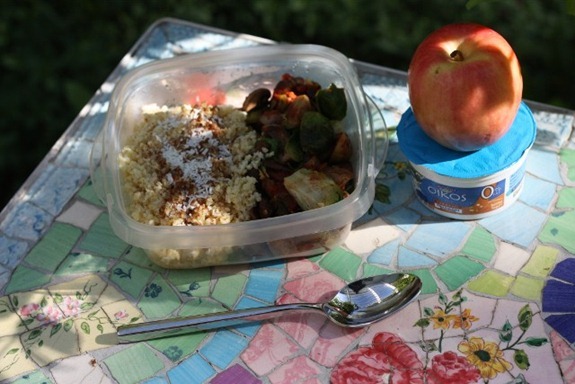 So here is a post summarizing my favorite lunchbox contents – all real examples from my working and on-campus days. 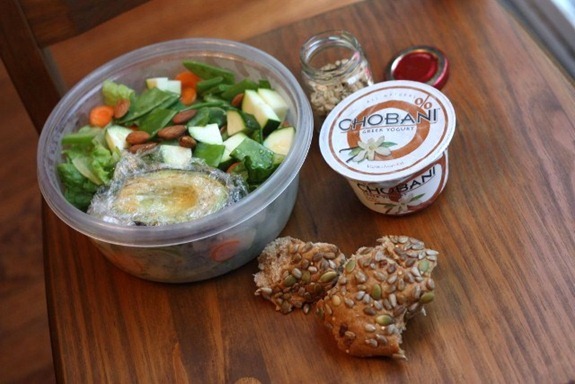 By far my most popular lunchbox item is yogurt – I find it so filling and it sits heavy in my stomach. I have never cared for deli meat that much, so I often pack yogurt as my protein item or top a sandwich with tempeh, cheese or smoked salmon. 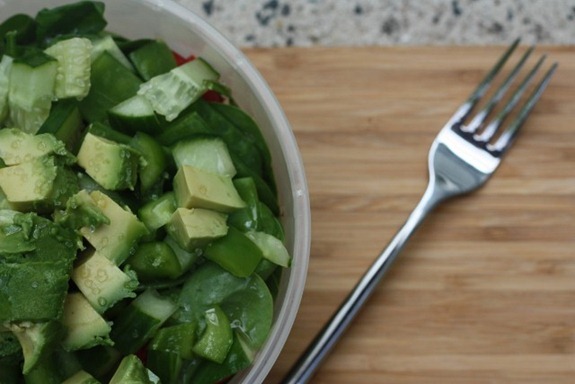 I am a huge fan of throwing some mixed greens in a tupperware with some pre-chopped veggies as a side salad. I often just drizzle on some olive oil as dressing to keep things simple. The greens wilt a little but nothing to spoil them. Making my own dressing is fun, and I do pack it from time to time, but it’s too much work for me to pack everyday. 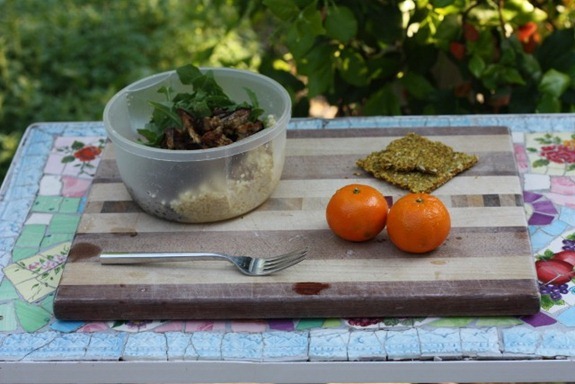 Following are lunch examples and links to the posts for more information! 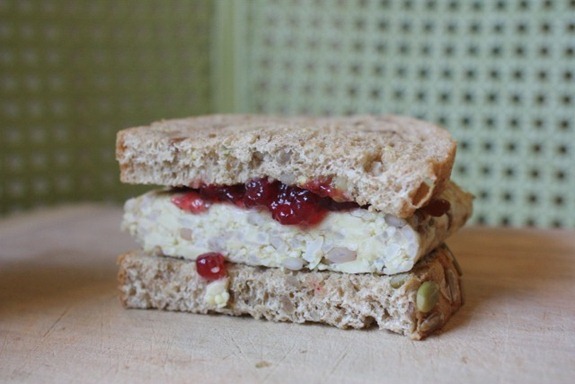 Tempeh and jam is one of my favorites! I just slice the raw tempeh and smother on a thin layer of jam. Wraps are another fun sandwich alternative! 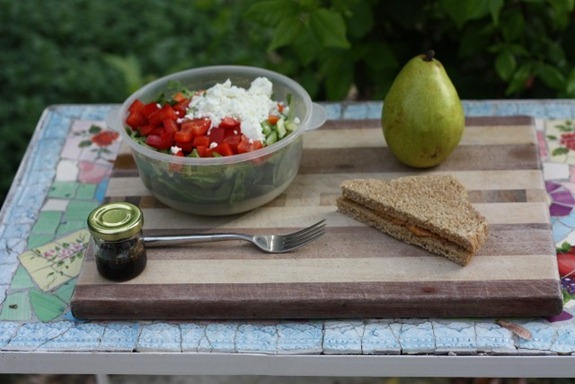 Nut butter on whole grain bread with salad and goat cheese and a pear. Homemade dressing on the side! 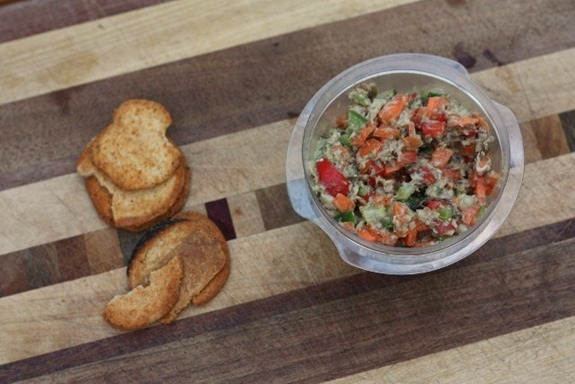 Canned salmon or tuna salad is a favorite. Prepared with chopped carrots/celery/peppers, a tiny bit of mayo and mustard and often, curry powder. 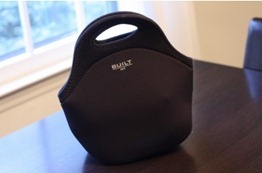 By far my all-time favorite lunchbox (literally) is this Built NY one. I hope you’re now hungry for lunch! Love this post! 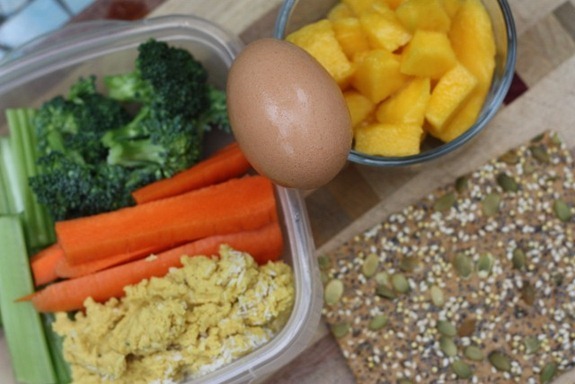 I bring my breakfast and lunch to work every single day so these ideas are super helpful! 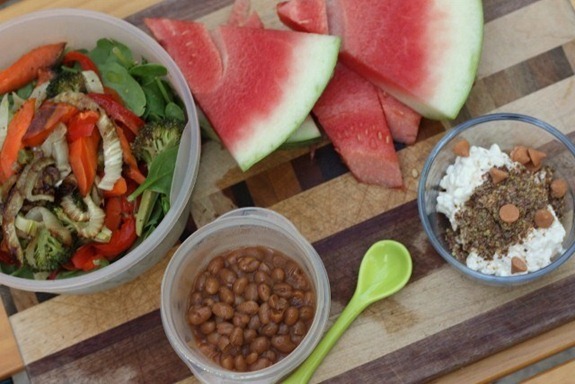 Plus I pack lunch daily for 3 kids and they would enjoy many of these ideas also. Great round-up Kath! Very cool to see so many ideas in one place. I remember reading those posts when you were at work and in school, so it’s fun to see them shared again. This will definitely make it easier in the future for referring readers in need of lunch ideas. I imagine it took a while to put this together, but it’s definitely worth it. 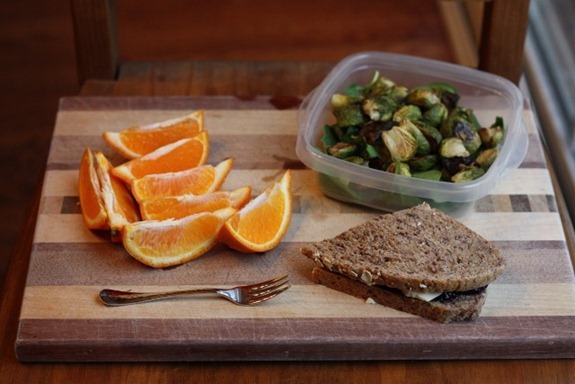 THANK YOU for sharing these lovely lunchbox ideas. Puts my Cambell’s Cup of Soup and a mini Honey Crisp apple to shame for today. Can’t wait to go home tonight and try to mimic one of these great meals! lovin that bag! I’m a 5 day a week homemade lunch girl myself. Great post. I generally try to follow the same guidelines whether I pack my lunch or eat at the hospital cafeteria! I miss hearing about your classes! Oh but then again, now I get to hear about Maze! This is probably the post I’ve ever read!! Thank you so much! OMG, can I just say how much I LOOOOOOOVE this post!?!? You rock girl! So pinning this! I always thought hummus was a good meatless protein source too, but almost every brand I buy only has 1 or 2 grams of protein per 2 tbsp! Seems like it is a better fat source than protein source. Isn’t that odd? I feel like everyone (me included!) has used it as a protein replacement but I was so shocked to see the low protein content. Tempeh and jam! You just blew my mind. I love reading food combinations that I know I would not come up with on my own. Thanks! Thanks for this fun round-up, and glimpse of your “past lives”! I tend to be a hearty salad, plus a side of carbs and fruit kinda girl. I’m planning to make your sardine salad for my own packed lunch later this week. I’ve had a can of TJ’s sardines for months, and finally have celery and carrots on hand to make a tasty salad. You turned me on to built lunch sacks years ago, and I’ve now got a whole collection of various sizes and designs…they are the best! Terrific work on this tutorial, Kath! Yum. Thanks for this lunch box post. I always have such high aspirations for packing awesome lunches and then I get busy and end up throwing whatever random food I can into my lunch box and running out the door. 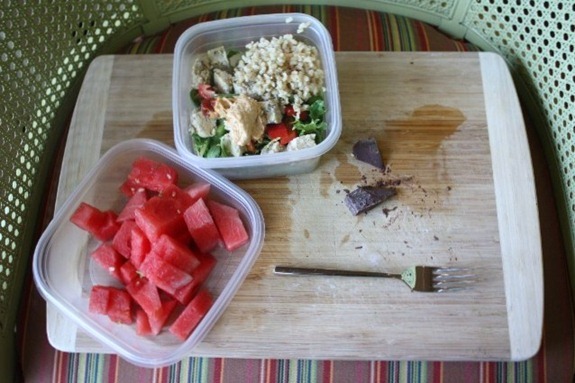 We have a lot in common…my diet is very similar and I have the same lunchbox, love it!!! This is such a great reference! 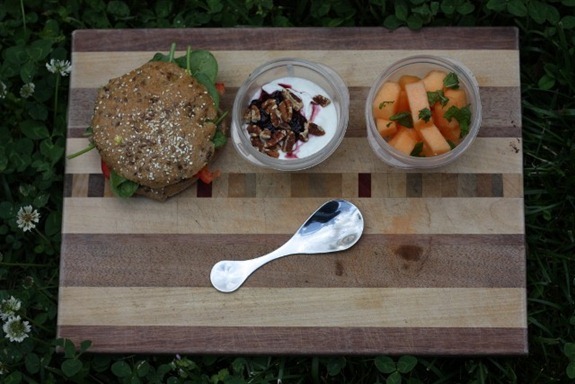 These are also great picnic ideas for when the weather get’s nice outside. Great ideas! I think the hardest part for me at law school is that I can’t refrigerate anything so I get nervous about bringing yogurt! i’m in school too, so i face the same problem. i put mine in with an ice pack at 9am, and it’s still fine to eat around 4pm! that’s when it has juuuust started to move towards room temperature, but only just. i usually save it for a snack, but it would still be perfectly cool at 1pm for my lunch! I have one and LOVE it! It keeps food cold all day. I freeze my individual yogurts overnight, then bring them to school. They should be thawed 4-5 hours later, and once stirred, have the consistency like frozen yogurt:) you can bring an ice pack a little icepack if you are nervous about temps. It works great! Great ideas! I always have to pack up food for one engagement or the other so this is really helpful for some inspiration! Loving this post. I eat lunch away from home most days and I get so bored with the food I pack sometimes. I love having a fun, delicious lunch to look forward to! I pack my lunch everyday and appreciate the tips. Thanks! This post is super awesome! So helpful and so fun to read 🙂 Thanks for doing what you do! Great post! Lots of great ideas. I pack my breakfast & lunch everyday for work. Great post! Especially for a college student, haha. I wasn’t one asking for ideas, but this post has given me some good ideas. I got into the habit of Amy’s frozen meals at work everyday and I’d like to get away from that. I love my Built lunchbox! I’ve had it for four years or so and I love that I can just throw it in the washing machine if it gets nasty! Wow!! 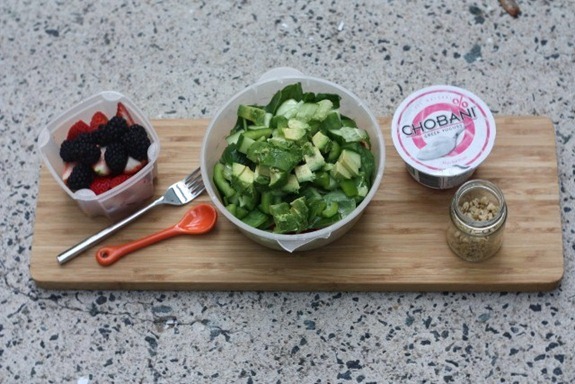 So many amazing lunch ideas. This post is a godsend 😉 I’m pinning this so I can come back to it later. Great Post! Do you have any tips for keeping things cold? 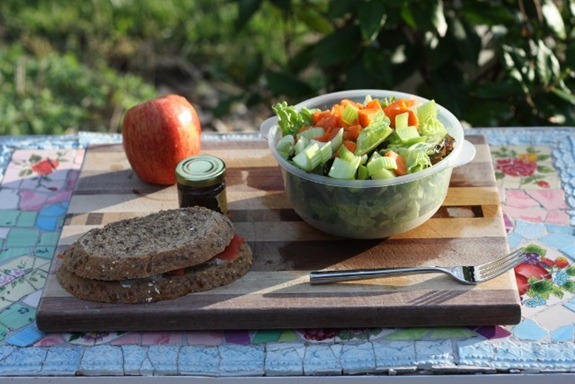 What are some general rules for food safety when you pack your lunch and won’t be able to keep it in the fridge? A few ice packs in an insulated lunch box should be just fine to get from fridge to lunch. I usually just stuck one of those blue packs in my box. Going from breakfast to dinnertime might be a bit more challenging without a cooler. Check out this freezable lunch bag. I have one and love it! There are many days that I leave at 9 am for school and still have cold yogurt at 6 pm. My classmate recommended it to me… and several of us commuters all bought one and fell in love! Great post Kath! It’s always great to get new ideas or lunches! Nice round up–but I just have one thing to add as a PSA to others: don’t be that person that eats fishy salads in a traditional office setting!! Haha. It is such a pungent smell that sticks around the cubes all day. So if you are going to eat your fish, take it away from your desk! Very helpful! Keep up the great posts. Packed lunches are so fun! This summer I’ll have to bring my lunch to school every day (no dining halls in the summers) and I’m so excited to play with summer flavors in my lunches. Fresh fruits and veggies galore! Right post at the right time,Kath! I love you! I like to prep 2 or 3 things on Sundays (chili, soup shredded chicken in the crock pot, homemade meat sauce, chicken breasts for salads) and pre-pack them in single serve tupperware to use for lunches all week long. It’s nice to have a few different options so you don’t get bored. 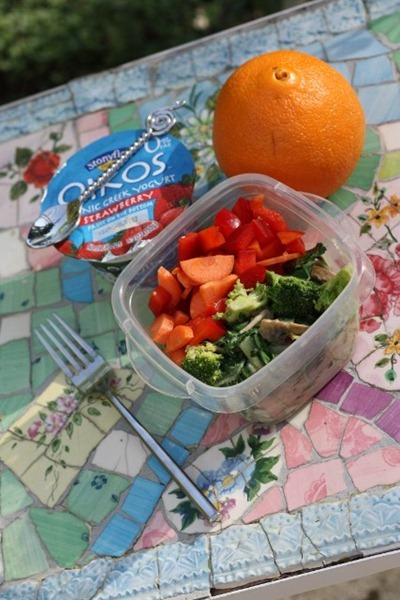 Cut up veggies, fruit and yogurts are my go-to side items as well!! I totally need to try tempeh and jam!! You don’t seem to eat a whole lot of tempeh these days, have you just lost touch or you trying to reduce your soy intake? – just me being nosey! Just forgot about it without packing lunches much. We had it for dinner last week! You don’t mind the heavy feeling from yogurt or a certain food? I would think that’s a bad sign – slows the body and digestion down? 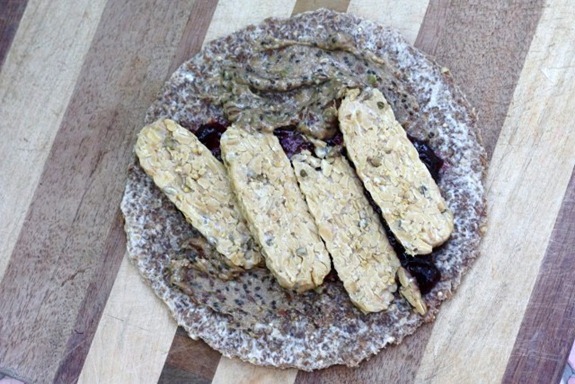 I have never thought of pairing tempeh with jelly or nut butter! Genius. And I thought it was weird that I sometimes eat tempeh raw with some mustard or ketchup on the side! Wow, those are amazing and put my small rotation to shame! Great post! 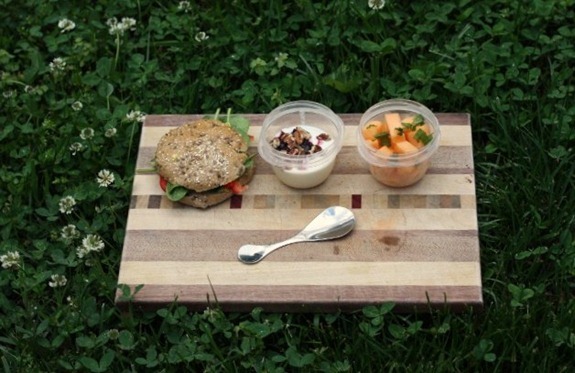 Reminds me of my 5 minute packable lunch post series! 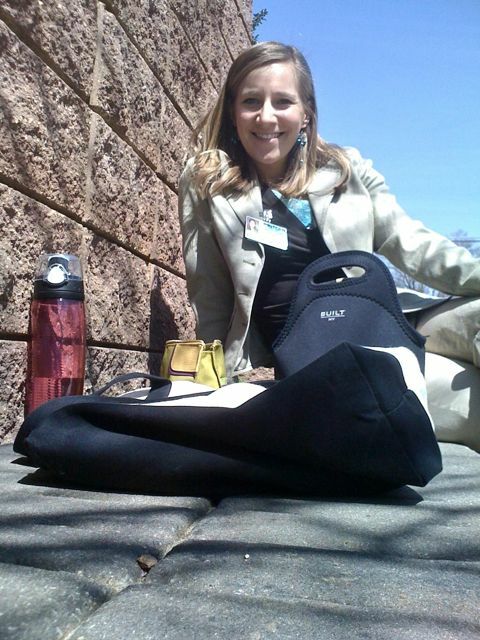 I’m doing my dietetic internship right now which is fun because reading about yours (it feels like long ago now!) is what made me what to go back and be an RD! Hi, I love the fact that even when you’re packing lunches you’re trying to get the balance right between protein, carbohydrates, fats, vegetables, around 500 calories and a variety of textures. Seriously it’s just wow. Don’t know how you manage it. Thank you for this post! Now I have TONS of lunch ideas for the next few weeks. Oh and I spot a common theme-a piece of chocolate is not just a necessity, it is a requirement! A gal after my own heart! Toooooootally singing D*ck in a Box now, thanks to your title. Oh well. 🙂 Thanks for the lunch ideas– every other semester, I bring my lunch to school, post-teaching, and these are some really great ideas! Thanks for an awesome post like usual! Thanks for the great ideas. One of my go-to lunches is a whole wheat tortilla spread with refried beans, topped with a sprinkle of feta and a few generous handfuls of greens (arugula, spinach, etc.) — tasty and eminently packable. I also really like sardine salad with grated carrots, chopped scallions, soy sauce, and a drizzle of sesame oil instead of mustard/mayo or yogurt. BEST post ever!!! Thank you Kath, this is so helpful. Have you been to Starr Hill Brewery, South street brewery or Devil’s Backbone? What did you think? I haven’t been to Starr Hill yet. DB is great. South Street is more brew pub than brewery. Blue Mountain is my fav. I absolutely LOVE this post. 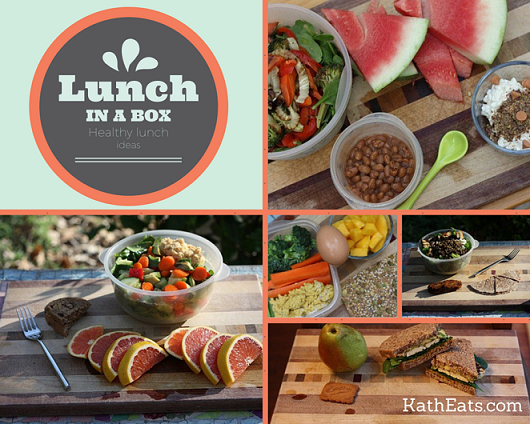 It’s filled with so many different lunch combinations I can’t wait to try! Thank you once again for sharing your creativity! You are always inspiring my sister and I in our own kitchen! You have terrific meal ideas. But how do you post so may of the, and who eats all of the stuff you show? 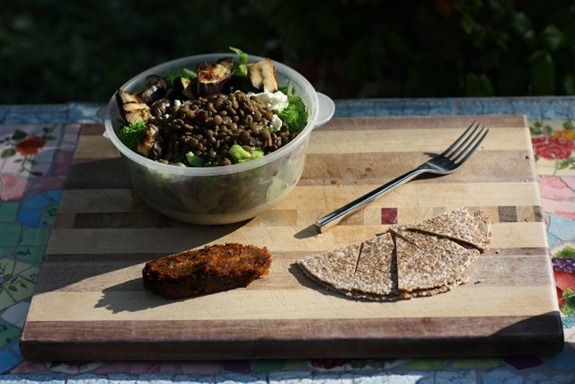 Are you preparing different meals for ten or fifteen people every day? Loved this! I’ve been kinda stuck in a rut with lunch ideas so this was perfect timing. I never thought to eat tempeh raw like that! I always thought it had to be cooked. 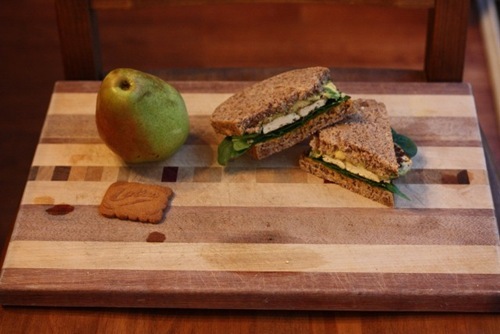 I will have to try that tempeh/jam sandwich! Kath, I’m really enjoying your new format of your blog since you made the change. This was a great and helpful post. 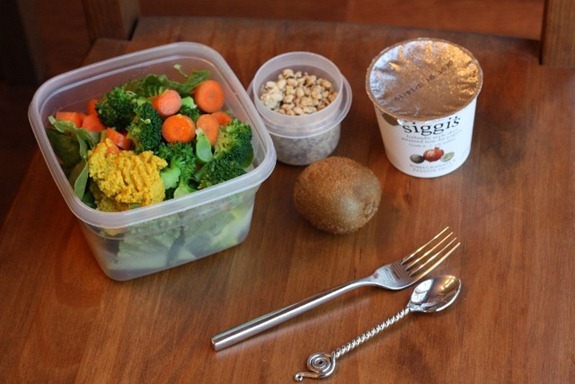 I usually have to pack a lunch and dinner so these ideas are helpful and good building blocks. Thanks, Kath! This is a great reminder that I can put together something healthy everyday and of how enjoyable that can be! Wow, this is really helpful! Thanks so much for the great post! And it also occurs to me that when Mazen starts preschool in 3 years or so I’d love to see your school lunch ideas for him! Brava! thank you for this lovely post, so useful. Great meal ideas! 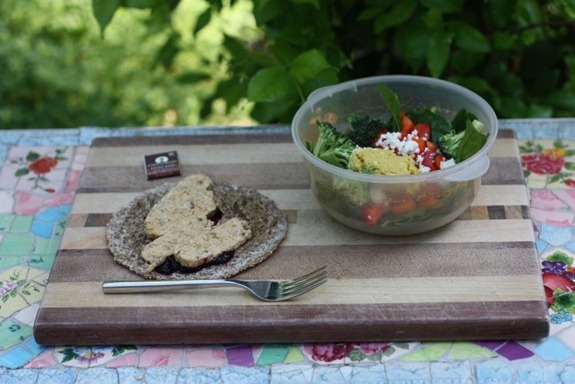 It is so helpful to have visuals of complete lunches. I will definitely refer back to this post when I need inspiration. I love this post! Great lunch ideas 🙂 Thank you, Kath! Hey Kath, I am not sure why, but your page shows up enlarged and “not right” on Mozilla Firefox. However, when I use Chrome, it is A-OK. But anywho, as a student who is on campus nearly all day and doesn’t like buying meals for budget and health reasons, LOVE THIS POST. I’m really not sure why. Do you have the latest version?? Thank you so much for this post, Kath! I’ve already read it three times since yesterday 🙂 I always pack leftovers myself (or a peanut butter and banana sandwich if I am stuck!) so it’s great to see some new options. Also, the carb/protein/fat thing is great to keep in mind. It’s very easy to overeat in a desk job so it’s important to pack foods that will satiate! Cheers! 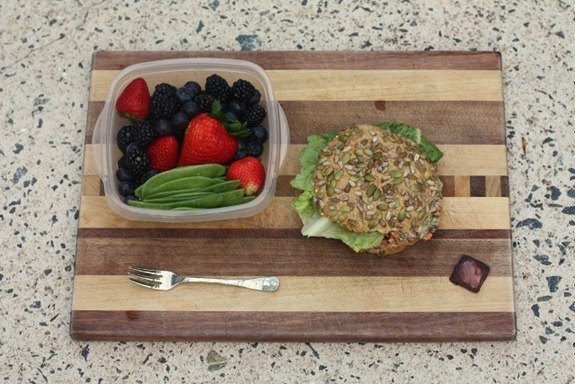 Great ideas for lunches! I work 12 hour shifts and I try to pack all my food for the day or night and sometimes it gets pretty redundant. It’s always nice to see what healthy foods others are packing. I love the look of the bread you show in your pictures. I love my breads and those look great! I don’t think I will ever have to think of another lunch to pack for work ever again. This post is great-thanks so much Kath!! This post is very inspiring! It makes me more excited about packing my lunches. 🙂 Thank You! I’ve been reading about PB2. Do you consider that real food? Sounded interesting but too processed so I wanted to hear your thoughts. Thanks for the ideas!!! 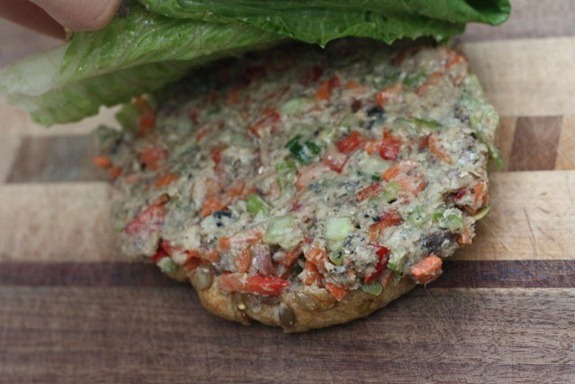 However, is raw tempeh safe to eat? Do you heat it first and just eat it cold? http://www.tempeh.info/faq/faq.php I always thought it was something like raw chicken that you had to wash your hands after even handling it raw! I whole-heartedly believe that since leaving my job and therefore eating lunches at home, my food intake has been so much more nutritious and full of variety. Mainly because I have access to so much more cooking and ingredients. Granted, none of my packed lunches every looked anything remotely as beautiful as your awesome lunch creations pictured above! Great ideas! Wonderful ideas! My daughter’s starting Kindergarten next year and I was lamenting the quality of school lunches. Luckily she is totally on board with bringing a lunch. Hmm I’m wondering if you keep the yoghurt that you packed in a fridge or something? Cos usually dairy products can’t withstand room temperature? All these dishes look delicious. You always create such a healthy variety of foods. 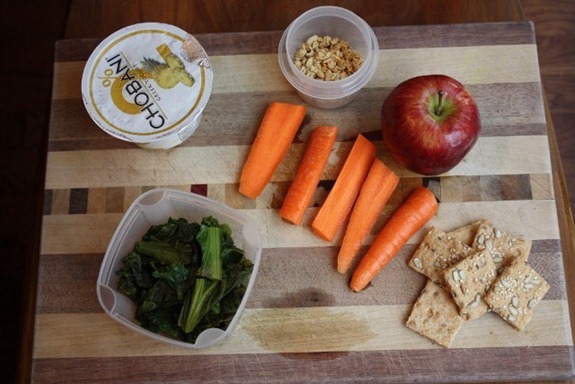 It can be difficult to put lunches together that are well-balanced. 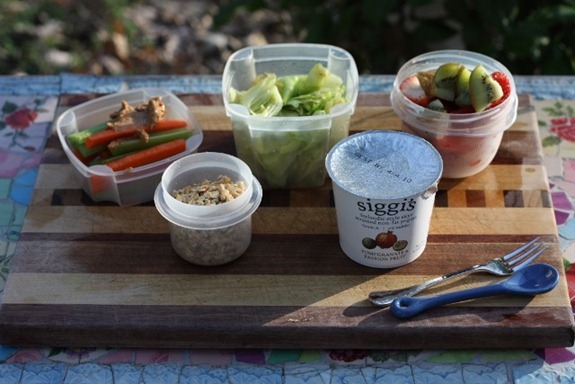 Do you have a preference between the two yogurts- Oikos or Siggi’s? Which one do you recommend? I love them both for different reasons. Oikos is smooth and runny and Siggi’s is so thick. 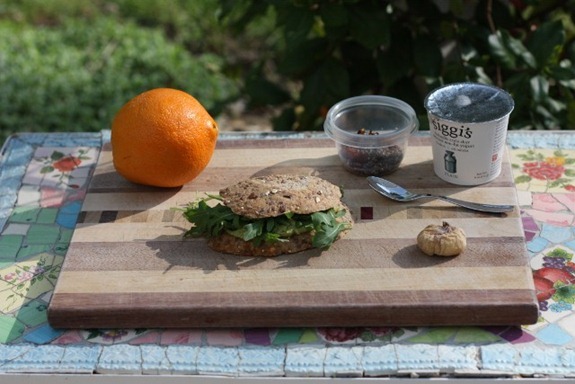 Siggi’s flavors are great because they are much lower in sugar. I only eat the plain Oikos. Thank you! I noticed that Siggi’s is very low in sugar so it seems much healthier. 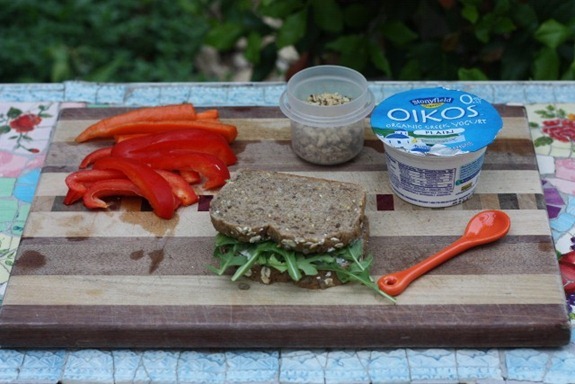 We will have to try Oikos in plain. I’ll bet it’s yummy if you add fruit and granola to it then! This post is amazing. What wonderful suggestions for lunch. I love it when I discover a like-minded blog, and have added you to my reader. 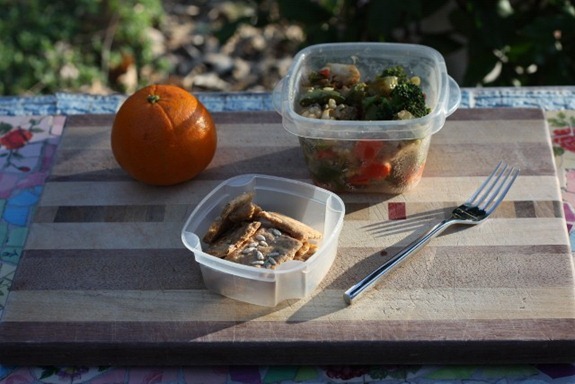 Haha, I’m restarting my bento blog and surfed on over here because of your post title. Nice lunches, Kath! So many good choices, and not the usual litany of lunch fare either. 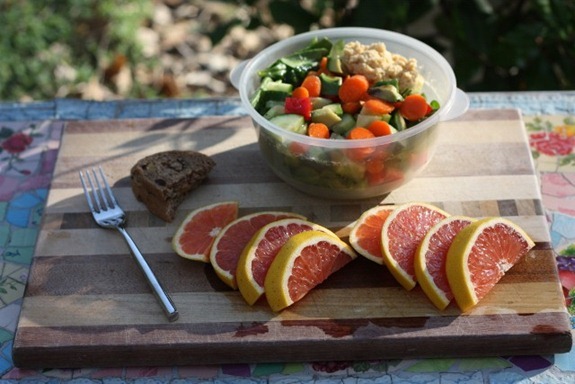 Thank you for a vibrant, colorful page full of ideas for healthy lunches. I shared it with peeps on my (almost) new Facebook page, Cooking with Whole Grains & Whole Foods. Great food tips. I really like them and ejoyed while I read them. Thanks for sharing them with us. Love the effort you put into this post by showing many different options. I’m going to try some of these!